the greater should be your mercy. 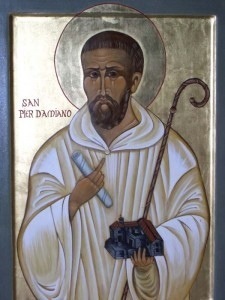 ..
St. Peter Damian, like yesterday’s inspirational figure, was born into poverty. While he struggled financially, he was not deterred mentally. His older brother Damian (who Peter adopted the name Damian from), an archpriest, encouraged him to study the faith and become a scholar focusing in Theology and Canon Law. St. Peter Damian did so. At some point while serving the church and the academy, he decided to leave both and become a Benedictine monk. He dedicated his life to reforming the church, as in that era, the church was full of hypocrisy and corruption. I had a conversation regarding PhD programs with a colleague of mine. She completed her program, PhD in hand at a school I’m considering. We kind of did it in reverse; I earned my M.Div and DMin (expected) and then, hopefully, PhD. She did the PhD, MDiv (expected), and hopefully DMin. St. Peter Damian used his education the way God wanted him to. He could have went into teaching at the university level and wrote enough books that seminarians in 2013 would be forced to read. However, he chose to become a reformer and monk. He decided to use a worldly good, education, and use it for the uplift, development and sustaining of God’s Kingdom on Earth. His story really resonated with me. We all should use our worldly goods for the Kingdom of God. I have a lot to ponder. We have a lot to ponder.